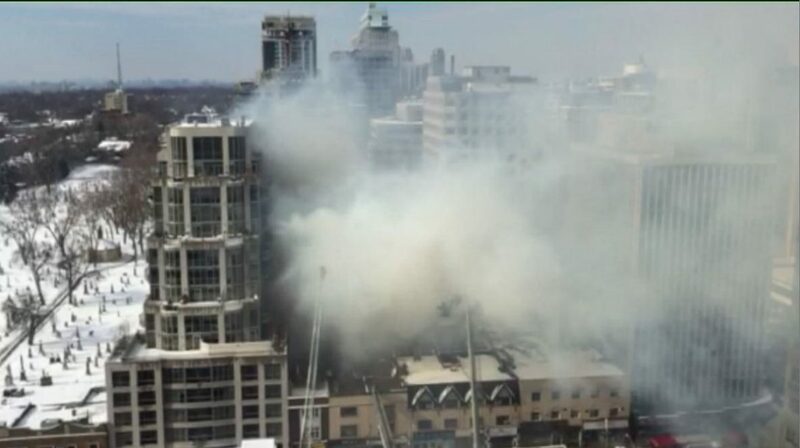 Toronto Fire Chief Matthew Pegg says the fire was extinguished at 5:45 a.m. Wednesday, almost a day after it began burning at The Badminton and Racquet Club. Water as deep as 12 feet has been reported in the basement of the building and Toronto Hydro along with Toronto Fire is working to pump the water out. In addition to evacuations, the fire also forced officials shut down roads and TTC service in the area. The inferno, which began just after 9 a.m., was eventually classified as a six-alarm with around 40 fire trucks on scene. "As we get into tomorrow (Wednesday), we should have a better idea as to when we can let people back in". Pegg said all but four evacuees were able to find accommodations after being displaced by the fire. Pegg says residents and office workers won't be allowed back into the evacuated buildings until Wednesday afternoon at the earliest as they deal with expected hot spots and flare-ups throughout the day. "We are dealing with a large quantity of water and some water infiltration into hydro vaults", Toronto Fire Chief Matthew Pegg said earlier Wednesday morning. He said many factors need to be considering before lifting any evacuations. In terms of road closures, St. Clair east of Yonge is open in both directions, as is Yonge in both directions north of St Clair. Jessop said so far, there is nothing to suggest that any of the surrounding buildings sustained structural damage. "Anything that's left, there is an extraordinary amount of damage". In a letter to its members, the club said the fire appears to have spared the west side of the building which includes squash and tennis courts and the courtside lounge; however, there is "significant water and smoke damage in these areas". "At this point it would be speculative for me to guess that". A full safety assessment will have to be done before investigators are sent into the building. There had been a fire at the site before, Taylor said. Fire officials said they are still using neighbouring condo balconies to douse the hot spots and monitor any potential flare-ups. Streetcar and subway service at St. Clair Station returned to normal by for the Wednesday morning commute, the TTC said, though buses are still diverting around the scene. The southbound lanes on Yonge remain closed from Heath St E.to Pleasant Blvd. and St. Clair is closed from Alvin Ave.to Deer Park Cres.